A triple strand necklace full of wonderful rare and old beads. 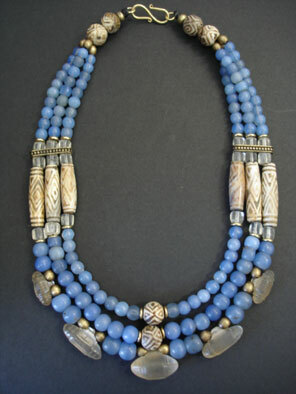 Many subtle hues of blue in the glass beads from Burma go beautifully with 12 antique early 20th century clay beads from Tibet/Nepal purchased by Rick Bennett on Thai/Burma border in 1982. 5 old Rock Crystal pendant beads in varying sizes from the African trade and Bohemian Czech rare and old 1900's cube glass beads. Scattering of Nigerian brass beads and spacers and the necklace is finished with a gold vermeil clasp.